Welcome to the Chillicothe Metropolitan Housing Authority’s website. Thank you for your interest in the programs managed by our agency. We hope this website will serve as a guide to our policies and programs and that it will be used as a tool to assist you with your housing needs. The Chillicothe MHA is a political subdivision of the State of Ohio and was created in 1965 by authority of the Ohio Revised Code. Chillicothe MHA serves Ross County, Ohio and is governed by a five member Board of Commissioners (one being a Resident) serving five year terms upon appointment by local elected officials. 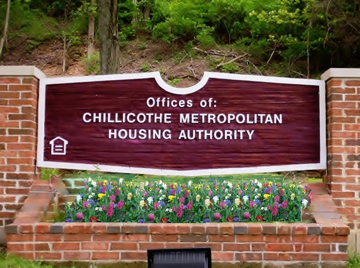 The mission of the Chillicothe Metropolitan Housing Authority is to promote adequate and affordable housing, economic opportunity and a suitable living environment free from discrimination. We hope this website will answer many questions that you have about our programs and about our agency. If you have additional questions, please contact us so we may assist you with your housing needs at (740) 775-7881. Please remember that it is extremely important that all applicants keep our office informed on your current information, including address, telephone number, and household composition. The Housing Authority must be notified of any changes in writing, we cannot accept information verbally.